1 Sunny with a few fair weather Cu around noon. Tmax top 3: Chievres 19,0°C, Munte 18,3°C, Brasschaat & Diest 18,0°C. 2 Clear night with even some hoar frost, although Tmin was +2,6°C. Only station with frost in the air was Elsenborn : -1,0°C. Brasschaat had 0,6°C. Sunny Spring day, in afternoon slowly some Ac sheets from S. Tmax top 3: Florennes 20,0°C, Kleine Brogel 19,3°C, Bierset 19,1°C. 3 Another great spring day. In afternoon a bit unstable with a few TCu, in the province of Antwerp and Liège even a light shower of rain. Tmax top 3: Kleine Brogel 22,6°C, Brasschaat 22,0°C, Deurne and Ghent 21,3°C. 4 After a sunny start increasing cloudiness from SW. Light showers did occur from 1700 on, some moderate showers from 2200 on. Total amount of rain in my collector till midnight: 7 mm. In the early evening light thunderstorm activity was observed around Kortrijk. Tmax top 3: Kleine Brogel 20,0°C, Retie & Bierset 19,2, Diest 18,7°C. 5 Last night on the passage of the cold front another 3 mm in the collector. Maximum amount of rain collected in Belgium over 24 hours 0800-0800: Chievres with10mm. Dry with breaks from 0230 on, in morning tempo very cloudy with St, later breaking and becoming Cu. In the afternoon accompanied by some Ac fields and later a Cs layer. 6 Cloudy with Cs, later on some Cu and Sc. Very windy with from 1630 on overcast with light rain. Mainly dry after 1900 with 2mm in the collector. 7 Trailing coldfront over SE-parts of Belgium. Largest amount of rain (2000-0800): Spa 15mm. Dry Cu cloudy weather till noon, blustery shower with small hail around 1400. Afterwards Cb skies with a few light showers. Gusts up to 40KT. A light thunderstorm occured near Lokeren around 1430. 8 Between 0700-1000 passage of a trough with light rain: 4 mm in the collector. During the day mostly dry with Cu Sc. Around 1730 a shower with small hail. Tmax values: lowest in Spa: 4,6°C, highest Kleine Brogel: 12,4°C. Latter was the only station with double figures. In evening very windy at Ostend Airport up to 28KT with gusts 42KT. Late evening showery rain on another trough line. 9 A light rain shower around 0200, afterwards dry and clearing skies. Tmin 1,6°C and even a bit hoar frost. Over the Ardennes locally air frost (lowest Tmin Mont Rigi -2,3°C) with snow cover of 1 cm (Elsenborn and Spa). In forenoon TCu skies sometimes with virga of snow. After 1400 increasing Sc Ac cloudiness with a couple of hours slight rain. Only station with Tmax double figures: Kleine Brogel 10,9°C. Lowest was Elsenborn: 4,4°C. 10 After midnight light rain for seven hours with 2 mm in the collector. Sc cloudy forenoon, cold front with slight showery rain passing the area around 1500 followed by breaks but a few TCu managed to produce some slight rain showers. Towards evening clearing skies with the pillar optic at sunset. 11 After a clear night Sc fields in morning, breaking in forenoon and followed by formation of Cu. In afternoon a return of the Sc fields, but again clearing skies in evening. 12 Clear night and forenoon. Towards noon formation of Cu spreading out to Sc against subsidence inversion at 5.000ft. Breaking clouds towards sunset. 13 After a clear night overcast St cloudiness in morning. In forenoon lifting to Sc, from 1400 intermittent slight rain. 14 Intermittent slight rain until 1000 giving 1 mm. Later some gaps in the Sc cloudiness. 15 Very cloudy night: at first Ac, in morning St with mist. During forenoon cloudy to very cloudy with mixture of Sc Ac. Around 1400 a few spots on the cold front, afterwards breaking clouds but rapid cooling as T fell from 14 to 9°C within half an hour. Magnificent As mamma sunset. 16 Very cloudy night. Light rain between 0700-0900 and again light to moderate rain between 1100-1800. Returning frontal system brought 13 mm in my collector. Turning misty towards midnight. Tmax barely 7,5°C at Zaventem, only Koksijde went double with 10,1°C. During afternoon a few thunderstorms were observed in provinces of Luxembourg, Namur and Liège. 17 Whole period St overcast with mist, and also fog between 0600-1200. 18 Misty until 0800 but with clearing skies from 0300 on. Increasing Cs As cloudiness during forenoon with slight rain between 1200-1600. 19 Very cloudy day with As and Cs. 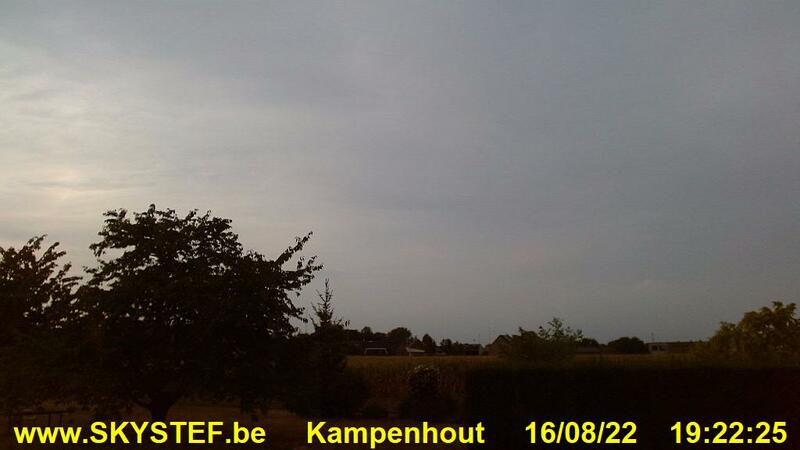 During afternoon weak thunderstorms developed over Poperinge and Kortrijk. 20 During the night misty and between 0600-0900 fog. Very cloudy with Cs As + a few Sc. Slight rain drizzle between 1430-1630. Afterwards clearing skies. 21 Clear radiation night with hoar frost. Garden Tmin: -0,5°C. Lowest Tmin: Elsenborn -2,6°C, followed by Brasschaat -1,7°C. All day long blue skies. Top Tmax: Kleine Brogel 15,7°C. 22 My gardens Tmin was 0,0°C. Lowest Tmin at Elsenborn -4,0°C, followed by Brasschaat -2,1°C. Blue skies, towards evening some Ci in SW. Top Tmax at Diest: 18,1°C. 23 Garden Tmin 1,8°C, lowest Tmin Elsenborn -2,1°C. Sunny forenoon with invading high and medium level cloudiness. Light rain between 1600-2100 collecting 1 mm. Top Tmax Kleine Brogel 20,6°C. 24 Quite sunny forenoon with developing Cu. In afternoon invasion of high & medium level cloudiness. Towards the evening "black skies" in SE, giving 1 mm of showery rain. This line of showers produced in the south of Belgium local shelf and roll clouds. Top Tmax: Kleine Brogel 21,8°C. In afternoon weak thunderstorms over provinces of Namur and Hainaut. 25 Cloudy but dry night. Light rain around 0800 and 1200 hours. At 1500 light to moderate bursts of showery rain accompanied by a weak thunderstorm: 7mm in the collector. Afterwards remaining grey with low clouds and intermittent slight rain. Today weak thunderstorms did occur near Liège, Aarschot and Mechelen with local flooding rain. 26 Misty night with stratus. Breaking clouds after 0800 and becoming cumuliform during afternoon. A light shower around 1600. During the evening invading medium level clouds with light rain from 2130 on. 27 Light rain ceased around 0030, followed by breaks: 1 mm in collector. Forenoon developing Cumulus, after 1330 Cb's with Mamma features. Weak thunderstorms around 1400 & 1430 and the second one was accompanied by hail with diameter of 0,6 cm. It produced 2mm within minutes. Afterwards dry and nice TCu skies, flattening during the evening. When looking at the lightning map of today there were quite a lot of thunderstorms with weak to moderate intensity over provinces of Hainaut, Brabant, Antwerp, Limbourg and Liège. All of them did occur between 1400-2000. Check also full weather report. 28 Sky clear night. Invading cirriform cloudiness in early morning. During the day becoming very cloudy with medium clouds, but remaining dry until the evening. 29 Pooring rain last night starting around 0030: 13 mm in the collector. Very cloudy day with St Sc. Drizzle during forenoon and also a bit rain around 1600. 30 Very cloudy day with Sc sheets. Towards the evening breaking clouds with even a few Ac castellanus visible.